Sky Poker is a popular European brand which is better known for its casino and sportsbook. They offer a 200% up to £500 bonus, along with a £10 no deposit bonus which is given in tournament tickets. The no deposit bonus also comes with NO clearing requirements or attachments, which is pretty rare these days. 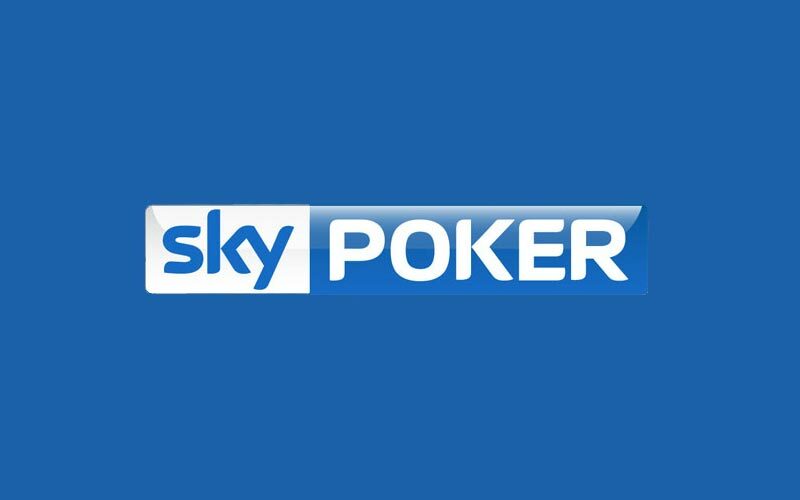 Sky Poker offers a 200% up to £500 poker bonus and is currently ranked #19 out of 28 reviewed poker rooms with an overall score of 66.80. Visit www.SkyPoker.com for more details and to download the official Sky Poker software. Before you make a deposit, you might as well take advantage of Sky Poker’s £10 free bonus. This bonus does not require a deposit and is given to all new accounts on the Sky network. The promo code may already be filled out for you, but if not, don’t forget to add it! If you don’t enter the code, you won’t receive the free £10. This means you won’t be able to play cash games, but the tickets can be used in any multi-table tournament or sit & go. You can also combine your tickets to play a higher buy-in. There are NO CLEARING REQUIREMENTS for this no deposit bonus, which is pretty sweet. This means if you happen to hit a big score in a tournament, you won’t have to worry about earning a certain amount of points before you can cash out. The money is yours and yours forever, no strings attached! This truly is a risk free bonus, so claim your £10 free today! Once you claim the no deposit bonus, you may want to consider depositing and earn an even larger bonus. Deposit any amount £10 or larger and receive a doubled match bonus. In other words, a £50 deposit will earn you a £100 bonus, up to a maximum of £500 (with a £250 or larger deposit). 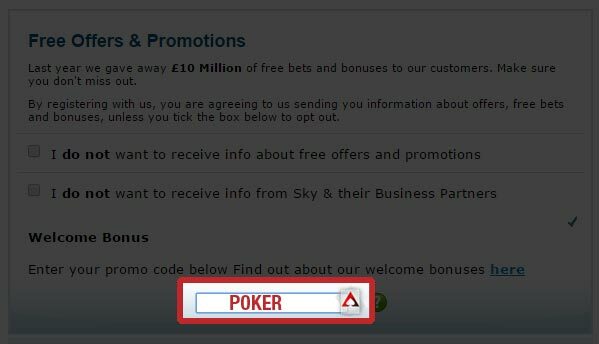 No Sky Poker bonus codes are required for the deposit bonus, it activates automatically upon making your first deposit. Yes, you can claim the £500 deposit bonus offer after you claim the £10 free offer, so don’t worry about that. Even though the £10 no deposit bonus has no clearing requirements attached to it, the deposit bonus does. Earn Poker Points under the Sky Poker Rewards club. Each time 250 points are collected, £10 of the bonus will be released. Points are awarded at the rate of 6 per £1 contributed in rake while playing cash games, and 10 per £1 in tournament fees paid. This means the bonus clears is more valuable for tournament players. A total of 12,500 points are required, which will cost £1,250 in tournament fees or £2,083.33 in cash game rake. You gain 40% more value playing tournaments, so we suggest doing that unless you only play cash. The bonus expires in 30 days, which sets the rake per day pace at £41.67 (tournaments) or £69.44 (cash games). Points per day for pace is 416.67. This is pretty difficult to clear considering Sky Poker is own its own network and traffic isn’t very high, but it’s not impossible if you have the time and can multi-table. If you can collect 10,000+ poker points per month, you will make the minimum tier of the Sky Poker Priority Rewards. Bronze level is anywhere from 10,001 – 19,999 points in one month. This levels awards a straight 10% rakeback meaning if you can clear the full bonus, your £1,250 paid in rake will be worth £125, setting the VIP value at 10%. If you’re looking to play now, you can visit SkyPoker.com now and start earning your £500 deposit bonus! Looking to get started? Signup at Sky Poker through Bonus Ace by using the link above. New players can receive the 200% up to £500 opening bonus offered, described in this review.